While every presidential inauguration includes a degree of presidential pageantry, there has been quite a bit of commentary on President Obama’s use of Martin Luther King, Jr’s Bible during his inaugural swearing-in service. One of the harshest critiques was given by my dear friend and graduate school mentor, Professor Cornel West. I got to know Professor West while I was a graduate student working on my master’s degree at Princeton Theological Seminary. Professor West was a professor at Princeton University. I was an active member and officer of the Association of Black Seminarians and an ordained minister in the African Methodist Episcopal Church. Professor West introduced me to the notion of the life of the mind and encouraged me to pursue my Ph.D. and to consider working in the academy. I received my Ph.D. from Yale University and began a career as a college professor. I consider it an honor and a privilege to call Professor West a friend and a colleague. While usually making it clear that he voted for President Obama, Professor West has been an outspoken critic of the President. For the most part, I have and continue to agree with much of Professor West’s criticism of President Obama. 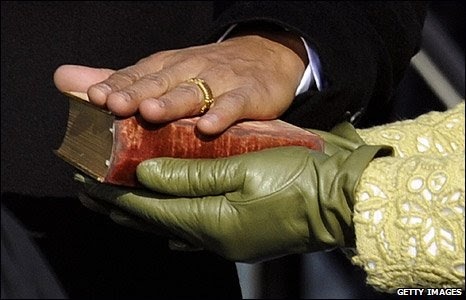 I do not, however, feel that President Obama was merely “playing with Martin Luther King” by using King’s Bible during his swearing-in ceremony. When I got the news that my dear brother, Barack Obama, President Obama, was going to put his hand on Martin Luther King Jr.’s Bible, I got upset. I got upset because you don’t play with Dr. Martin Luther King Jr., and you don’t play with his people. By ‘his people’ I mean people of good conscience, fundamentally committed to peace, and truth, and justice; and especially the Black tradition that produced it. Professor West also implied that the President’s use of King’s Bible was nothing more than a manipulative use of King’s “prophetic fire” during a moment of presidential pageantry. While I have often been less than impressed by the President’s commitment to social inequity, I have no reason to think the President’s use of King’s Bible was merely a manipulative use of King’s prophetic fire in the service of presidential pageantry. I believe the President’s use of King’s Bible represented much more than a moment of presidential pageantry. Without a doubt, President Obama’s use of King’s Bible was intentional, but it represented far more than co-opting King’s prophetic fire for a moment of presidential pageantry. I believe the President’s use of King’s Bible was part of a calculated attempt by the President at sending a specific message (a message that probably should have been much more explicit). The underlying premise of President Obama’s speech echoed the premise of many of Dr. King’s speeches. We as a nation have declared our destination, but we have not always committed ourselves to following the map that shows us the way. To arrive at our destination of a “more perfect union,” we have to take seriously the map that declares the worth, value, and equality of all humanity. While there are many things for which I can criticize the President, I don’t think his use of King’s Bible is one of them. President Obama was not simply engaging in presidential pageantry. His use of King’s Bible was a central part of conveying the heart of his inaugural speech message. The President sought to clearly articulate that every political action we take as a nation should reflect the one self-evident truth that all people are created equal. We the people declare today that the most evident of truth that all of us are created equal is the star that guides us still; just as it guided our forebears through Seneca Falls and Selma and Stonewall; just as it guided all those men and women, sung and unsung, who left footprints along this great mall, to hear a preacher say that we cannot walk alone; to hear a King proclaim that our individual freedom is inextricably bound to the freedom of every soul on Earth. I, like my dear friend brother West, am part of the black prophetic Christian tradition. I see our role–similar to that of the prophets of old–as delivering social critique against the structures of power. Politicians–President Obama included–will always be part of those structures of power. I understand the stirrings across the country for a candidate who will take a firm principled stand on the question of the war in Viet Nam and the problems of the poor in urban ghettos, but I must also add that I have no interest in being that candidate. I have come to think of my role as one which operates outside the realm of partisan politics, raising the issues and through action create the situation which forces whatever party is in power to act creatively and constructively in response to the dramatic presentations of these issues on the public scene. I plan to continue that role in the hope that the war in Viet Nam be brought to a close long before the 1968 elections and that this present Congress find both the courage and the votes to once again move our nation toward a truly great society for every citizen. King realized that the role of the President of the United States was significantly different than his role as a prophetic Christian leader. While it may not have been prophetic, President Obama’s choice to use King’s Bible was more than him simply playing with King and/or misappropriating King’s prophetic fire for a moment of presidential pageantry. I believe President Obama genuinely wants to bridge the meaning of the words, “We hold these truths to be self-evident, that all men are created equal…” with the realities of our times. If this is his intent, then he has a lot of work to do. If he’s going to invoke King, then he must be willing to grapple honestly with the meaning, implications, and costs of King’s vision. President Obama chose the role of a politician, not a prophetic Christian leader. Those like King–and brother West–who have chosen the role of a prophetic Christian leader must continue to challenge all those in power–including President Obama–not only by raising the issues but also by creating an environment that forces those in power to act creatively and constructively in response to issues of social injustice. Guy Nave is a professor of religion at Luther College in Decorah, Iowa. His research focuses on the topics of Christianity, religion and social justice, the social construction of religious meaning, and race-religion-and-politics. Professor Nave is currently researching the power, politics, and meaning behind the rhetoric of "change." Guy Nave received his Master of Divinity from Princeton Theological Seminary, and his Ph.D. in New Testament studies from Yale University. In addition to his blog posts here, he is a frequent contributor to Sojourners Magazine's online "Commentary" blog series.